Echoes In Time: A glimpse of the future? Dale Coleman is a burly, bearded mountain man with buckskin shorts and a knife at his hip. His earlobes are pierced with spikes from a deer antler. Coleman, who prefers the moniker Blond Bear, could make it just fine in a peak oil situation. He is an ancestral skills enthusiast and a co-founder of Echoes In Time, an annual gathering with workshops on hide tanning, basketry, herbal medicine and more. "People call what we do 'wilderness survival.' But I like to think of it in terms of thriving, not surviving,'' said Kiliii Yu, an Echoes instructor who specializes in crafting animal-skin kayaks. Earth-based technologies used by hunter-gatherers offer a historically viable model for living without money or oil. For instance, the wild plant horsetail can be used as a nail file; a tincture of Oregon Grape root is an effective antibiotic; and hides peeled from roadkill deer can become clothing. And those animal-skin kayaks? "Kayaks are one of the few ways you can get around without oil. You can launch through the surf to get fish when a fishing boat can't go out. And you can survive much rougher waters than with a canoe," Yu said. 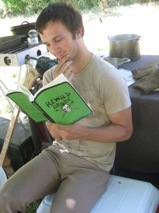 Pre-agricultural life ways are widely referred to as "primitive skills" by proponents, including wilderness schools and organization such as the Society of Primitive Technology, which publishes a seasonal bulletin with detailed how-to articles. But some do take issue with the term "primitive," because it conjures memory of the fallacious social evolution theories developed by Euro-centric thinkers in the 19th century.
" 'Primitive' is a derogatory term in my book. It has no meaning other than a comparative value of one culture against another," said Leland Gilson, a co-founder of Echoes and the former state archeologist of Oregon. "[Hunter-gatherers] were just as smart and clever as [post-industrialized people] today. They just used different materials." 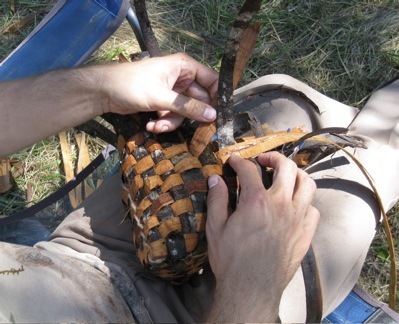 A pouch woven with strips of cedar bark. Wilderness skills were once the province of Boy Scouts and backwoods survivalists, but mainstream interest has been booming in recent years, with full-time immersion programs and weekend retreats popping up across the United States. Much of the appeal may be driven by the desire for a kind of poverty insurance during uncertain times; it also acts as a counterbalance against society's increasing alienation from the natural world, which Pullitzer Prize winner Wallace Stegner famously called a "headlong drive into our technological termite-life, the Brave New World of a completely man-controlled environment," in 1960's "The Wilderness Idea." Because some historians argue that socio-economic stratification in human civilization can be traced to the advent of agriculture, some enthusiasts consider the practice of ancestral skills to be a political statement in favor of anarcho-primitivism. "Primitive technology is a result of a social technology that was successful, and modern technology is the result of a society that's destroying the planet," said Peter Bauer, better known as the rewilding ideologue "Urban Scout." This year, Echoes was held in a grassy field at Willamette Mission State Park near Salem, Oregon, during a heatwave in late July. The gathering drew about 100 participants of diverse ages and backgrounds, including survivalists, history buffs, homesteaders, and generally "everything from hippie chicks with dreads to retired dentists," Coleman said. Some Echoes attendees said they rely on wilderness skills in their daily lives. "We're an intentional community of queer hunter-gatherers living pretty rustically on 40 acres in northern Washington state. We have to know about wild plants, hunting and trapping," said a 21-year-old woman who asked Culture Change to withhold her name. "We live in a place that's in the woods, so these things are very practical." Primitive skills meet-ups are much like hobby festivals, the prehistoric equivalent of Star Trek conventions and Renaissance fairs. There are rendezvous across the country, such as the upcoming Rabbitstick in Idaho next month. "There very well could be an end or a tough time, but I just like the simpler lifestyle," Coleman said, "The feel of knowing that I do a lot of the same things my great-grandparents did." Survival Challenge: Can a City Girl Live Off Wild Food For a Week in Portland?